'Hemingway's style is a superb vehicle for revealing tenderness of feeling beneath descriptions of brutality' Guardian. Keynote/Publisher's Comments'Hemingway's style is a superb vehicle for revealing tenderness of feeling beneath descriptions of brutality' Guardian. Ernest Hemingway was born in 1899. His father was a doctor and he was the second of six children. Their home was at Oak Park, a Chicago suburb. In 1917, Hemingway joined the Kansas City Star as a cub reporter. The following year, he volunteered as an ambulance driver on the Italian front, where he was badly wounded but decorated for his services. He returned to America in 1919, and married in 1921. In 1922, he reported on the Greco-Turkish war before resigning from journalism to devote himself to fiction. He settled in Paris where he renewed his earlier friendships with such fellow-American expatriates as Ezra Pound and Gertrude Stein. Their encouragement and criticism were to play a valuable part in the formation of his style. Hemingway's first two published works were Three Stories and Ten Poems and In Our Time but it was the satirical novel, The Torrents of Spring, that established his name more widely. His international reputation was firmly secured by his next three books; Fiesta, Men Without Women and A Farewell To Arms. He was passionately involved with bullfighting, big-game hunting and deep-sea fishing and his writing reflected this. He visited Spain during the Civil War and described his experiences in the bestseller, For Whom The Bell Tolls. His direct and deceptively simple style of writing spawned generations of imitators but no equals. Recognition of his position in contemporary literature came in 1954 when he was awarded the Nobel Prize for Literature, following the publication of The Old Man and the Sea. He died in 1961. The Essential Hemingway is the perfect introduction to the astonishing, wide-ranging body of work by the Nobel Prize-winning author. This impressive collection includes: the full text of Fiesta, Hemingway's first major novel; long extracts from three of his greatest works of fiction, A Farewell to Arms, To Have and Have Not and For Whom the Bell Tolls; twenty-five complete short stories; and the breathtaking Epilogue to Death in the Afternoon. 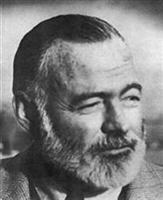 Ernest Hemingway was born in Chicago in 1899, the second of six children. In 1917, he joined the Kansas City Star as a cub reporter. The following year, he volunteered as an ambulance driver on the Italian front, where he was badly wounded but decorated for his services. He returned to America in 1919, and married in 1921. In 1922, he reported on the Greco-Turkish war before resigning from journalism to devote himself to fiction. He settled in Paris, associating with other expatriates like Ezra Pound and Gertrude Stein, a group Hemingway later dubbed the "Lost Generation". He was passionately involved with bullfighting, big-game hunting and deep-sea fishing. He covered the Spanish Civil War, inspiring his novel For Whom The Bell Tolls, and was present during the liberation of Paris in 1945. Recognition of his position in contemporary literature came in 1954 when he was awarded the Nobel Prize for Literature, following the publication of The Old Man and the Sea. He lived in Canada, Paris, Florida and Cuba before moving to Idaho where died in 1961.